AKRON, OH. – Until LeBron James became this city’s signature global brand, that honor belonged to the Goodyear Tire and Rubber Company. The world’s third largest tire manufacturer, with $21 billion in sales revenue last year, was founded here in 1898 and stayed put even as B.F. Goodrich, Firestone, and General Tire, its biggest competitors, closed their Akron plants and left in the 1980s. In a word, Goodyear and Mr. James, who was born and raised in Akron, and last month won his second NBA championship in a row with the Miami Heat, are devoted to this 188-year-old Northeast Ohio city. 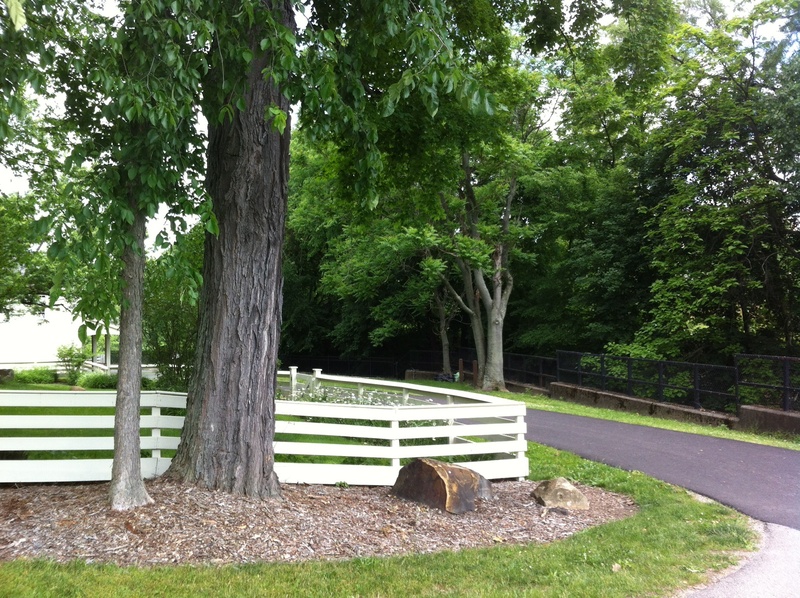 Both also turned to real estate development to sink deeper roots here. Mr. James, whose foundation is based in Akron and who has vowed publicly to become a billionaire, just purchased two properties that adjoin his gated compound on Akron’s west side. City officials say he is preparing to expand his holdings there, which include a 35,000-square-foot home. More than matching him is Goodyear. On May 13, the company’ top executives gathered in the city’s east end to formally open a 639,000-square-foot, seven-story, $140 million world headquarters, by far the largest office building ever constructed in Akron. A week ago The New York Times posted and published my article on Akron, the latest in a series of piece I’ve reported for the paper on the reviving Rust Belt. Later this month I write about Buffalo, NY for the Times. 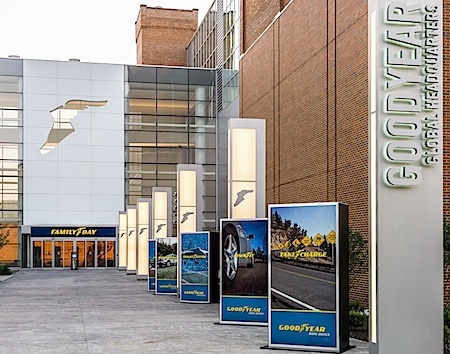 During the ribbon-cutting ceremony, Richard J. Kramer, Goodyear’s chairman, president, and chief executive noted the building’s advanced communications capacity, energy efficiency, and other high-tech features. He described how the seven-story building, which is connected to the company’s 860,000-square-foot Innovation Center, renovated at a cost of $30 million, enables the company’s professional and research staff to more easily collaborate. Akron, founded in 1825 as a center of waterborne commerce along the 40-foot wide Ohio and Erie Canal, knows something about era-defining transitions. Agriculture became such a mainstay in the mid-19th century that the small grain companies that merged to form Quaker Oats were started here. Quaker Oats operated a mill downtown until 1970. Most of the city’s development, though, centered around making tires for America’s trucks and cars. From the time Benjamin Franklin Goodrich opened the city’s first rubber factory in 1871, until the 1980s, the rank smell of heated rubber was this city’s unmistakable industrial scent. The black dust of tire manufacturing hung over four separate mammoth tire manufacturing works, and a constellation of smaller plants. Akron was a gritty and polluted city that employed 58,000 rubber industry workers in 1930. In 1960, the city’s population peaked at 290,351, according to the U.S. Census. Even as late as 1980, according to a study by the Brookings Institution’s Metropolitan Policy Program, Akron’s tire and rubber industry employed 26,000 people. But by the end of the decade Goodyear was the only big rubber company left in Akron. Today there is scant tire manufacturing in the city. B.F.Goodrich merged its operations with Uniroyal in 1986 and shut its 3-million-square-foot Akron plant. Bridgestone, the Japanese company that bought Firestone in 1988, manufactures tires for Indy-class racing cars in a corner of its largely empty 1.3 million-square-foot plant on Akron’s south end. Goodyear makes tires for NASCAR races in a portion of its campus here. Just like the other industrial cities of the Midwest that formed the Rust Belt, the end of tire manufacturing, and the loss of over 20,000 jobs, was the start of a long period of civic trauma that sent the city’s population skidding. Last year, according to the U.S. Census, the number of city residents dropped below 199,000, the lowest in a century. Akron, though, is far from dead. Even as three tire companies departed, and Goodyear shrank its manufacturing operations, they left behind expansive campuses close to the city center that contained a collection of stalwart manufacturing buildings made of red brick and reinforced concrete that could be modernized to serve 21st century markets. In 2007, Industrial Realty Group, a Downey, California-based developer that specializes in turning old manufacturing sites into mixed-used developments, reached agreement with the city and Goodyear to buy 480 acres of the company’s campus, and all of the buildings located there, for a mixed-use development named East End. The development plan, activated in 2010 after a two-year delay caused by the recession, calls for constructing a new $17 million, 135-room hotel, and renovating the 292,000-square-foot Goodyear Hall for 110 market rate apartments, retail space, a conference center, and a theater at a cost of $36 million. Both lie adjacent to an interchange for Interstate 76 and just north of the new headquarters. Stuart Lichter, Industrial Realty’s 64-year-old founder and chairman, said his company also is spending $95 million to turn the 1.5 million-square-foot complex across the street, the site of Goodyear’s old headquarters, into four stories and 800,000 square feet of office space, and three stories of indoor parking. Construction on these projects is underway. The hotel and Goodyear Hall will be finished in 2014, said Mr. Lichter. The larger renovation concludes when the last tenant is recruited, he said, and could take several years. Goodyear’s bright, airy, library-quiet headquarters building, and the $40 million, 952,000-square-foot, five-story parking deck connected to it by an overhead walkway lie at the southern end of the former Goodyear campus. In all, private spending on the new headquarters, parking deck, and the rest of the East End development is $378 million. The city, state, and federal governments are spending $227.6 million in public funds for infrastructure development, according to city figures. Goodyear doesn’t own its new headquarters or the parking structure. Under the terms of a single-tenant 25-year lease agreement negotiated by Mr. Lichter and Goodyear, the two structures are owned by Angelo, Gordon and Company, a New York-based real estate investment firm, which financed the construction costs of both and collects lease payments from Goodyear. Another novel provision of the agreement, said Mr. Lichter, was his promise to ensure that Goodyear’s cost for operating the new facility would not exceed the cost of operating the obsolete headquarters that it was replacing. Mr. Lichter was confident he could make the numbers work. In the late 1980s, he purchased B.F. Goodrich’s plant in Akron and collaborated with the city to turn it into Canal Place, a $30 million, 27-acre, 1.8 million-square-foot office and retail complex of 12 buildings that house almost 100 businesses and where over 1,000 people work. Mr. Lichter was helped by two other men who are widely credited with instigating the city’s revival – Akron’s longtime mayor, 64-year-old Donald L. Plusquellic, who was elected in 1987, and Luis M. Proenza, the president of the University of Akron since 1999. Dr. Proenza led a $643 million capital construction project that produced new residence halls, classroom buildings, athletic facilities, science institutes, and engineering centers that turned a downtown commuter college into an influential engineering and polymer research university located on a handsome and modern urban campus. The university’s graduates, said Dr. Proenza, are staffing a host of entrepreneurial high-tech companies in polymer development and engineering that are settling in and around Akron.